Are you suffering sciatica and live in the Maroochydore area? Then we’d like to help you. Sciatica is the the term used to describe pressure on the sciatica nerve often resulting in pain down the back of the leg. The pain may stop above the knee or it can travel below the knee into the calf or in some cases into the foot. Sometimes the pain can be sharp, like an electric shooting pain. Along with the pain people can also experience a feeling of pins and needles or numbness on the skin. 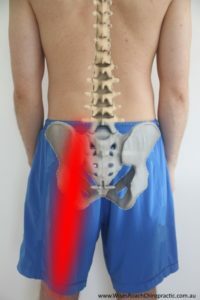 The pain down the leg may also include pain in the lower back and/or pelvis in any of the combinations described in the lower back pain or pelvic/hip pain sections. The main causes of sciatica can be the lower back, pelvis and/or muscles in the buttock area. A thorough assessment and proper examination is needed to determine exactly what is causing your sciatica and this will give you the best opportunity to get relief from your symptoms. Ultimately, we would love the opportunity to help you find the sciatic pain relief you deserve. When you come in for your first appointment, you will have a consultation and exam with Dr. Leevi (Chiropractor) that is specifically designed to uncover the cause of your sciatic pain. If we can help, we will recommend the most conservative and effective care for your unique situation.